March 17th. - Happy St. Patricks Day Celebration. My Saint Paddy’s Day dinner celebration. 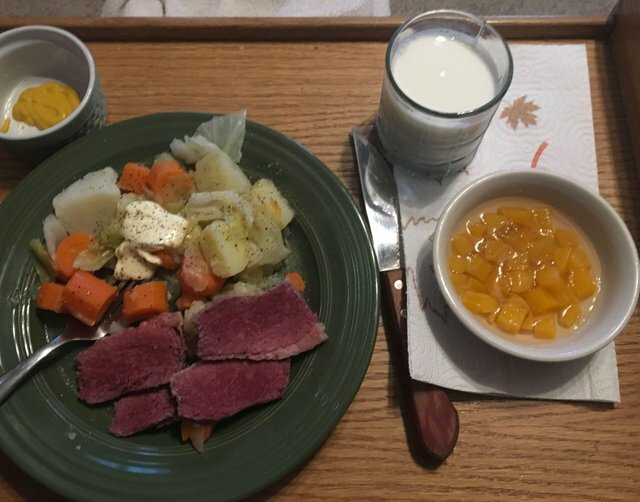 We have Corn beef, potatoes, carrots and cabbage dinner every year. All made the old fashion way. Yesterday an account was lost to a friend. We spend a lot of time developing our account. Why would you want to give it away. You have to look at how you access your account. There are 3 keys. Which key are you using to log into your account. I log in with my Posting key. It is stored in Google. I have a printed copy and a copy on another thumb drive of my Owners key. I never use the owners key. Never ! This is how I try and secure my account. How do you secure your account ????? I hope you read it. @pifc discord has a #information-library that is filled with information. Take the time to read some of these older posts. The threat will increase from scams and phishing as the price of steem increases. We have seen this before, so why would it not happen again. There is no quick way to build an account. So don’t fall for the free steem or easy gains. yummmm, came to see how your din din looks. and yep it looks rather irish. I am not familiar with St Patricks day but I saw many people posting their dinners on Steemit :) What do you guys celebrate on that day? Why is dinner (or the dishes) so special? I am a bit embarrassed to say that I used my Master Password to log in till a week ago. I was adviced by some Steemit friends to use my other keys (at that time I didn't know I had other keys, lol) but I couldn't find the right menu to switch them. I find Steemit extremely user unfriendly btw. Then last week (what a miracle) Steemit warned me about using my Master Password and led me to the menu to change it. So, is Steemit getting more friendly to people like me who just want to blog and don't care about programming or crypto?! I hope you are doing well and the doctor's appointment today is going just fine! Cross my fingers! I am glad the warning worked and you changed the password. Most of all it showed you how to change it. People just don’t know that they have different keys for different access levels. It does appear it is getting more friendly. The learning curve here is which, way high. I have to look at steem keychain. Dinner looks delicious! My mom always made the traditional corned beef and cabbage. I miss it! It came out good. And tasted good to. My tast buds are toast. Comming back slowly so not to often I really enjoy what I am eating and that was really good. Every year my wife makes the corn beef dinner. This year everything had more meaning and appreciation. And that dinner looks great !! We need to keep saying it over and over again. You got more than 8250 replies. Your next target is to reach 8500 replies. Your UA account score is currently 3.901 which ranks you at #4288 across all Steem accounts. Your rank has improved 47 places in the last three days (old rank 4335). In our last Algorithmic Curation Round, consisting of 246 contributions, your post is ranked at #32.